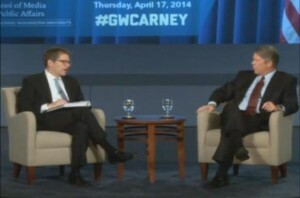 In a sit-down with Major Garrett at George Washington University today, White House Press Secretary Jay Carney covered a wide range of topics, including the impact of social media on news cycles, the prosecution of leakers, and his relationship with the White House press corps. But no revelation was quite as shocking as his admission that he is woefully behind on two of television’s most important Washington-themed shows. “I haven’t made it that far yet,” said the Press Secretary. Gasps could be heard from the crowd, mostly made up of students who binge-watched the entire season as soon as it was released. A visibly disturbed Garrett assured him that the reference would make sense if and when Carney ever finished the season. By contrast, Carney appeared very familiar with “The West Wing.” To the surprise of no one, he said that his favorite character was C.J. Craig and that another, minor character had been named after him by some of the show’s writers. There was no mention of “Homeland,” though we can safely predict that Carney probably agrees with the rest of America that the third season really jumped the shark.